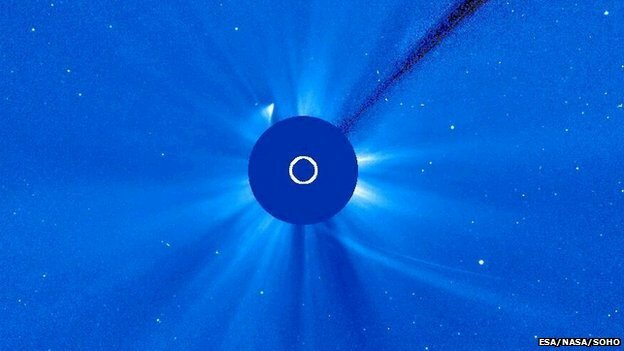 Some part of Comet ISON may have survived its encounter with the Sun, scientists say. The giant ball of ice and dust was initially declared dead when it failed to re-emerge from behind the star with the expected brightness. All that could be seen was a dull smudge in space telescope images – its nucleus and tail assumed destroyed. But recent pictures have indicated a brightening of what may be a small fragment of the comet. “We’ve been following this comet for a year now and all the way it has been surprising us and confusing us,” said astrophysicist Karl Battams, who operates the NASA-funded Sungrazing Comets Project. The European Space Agency (ESA), too, which had been among the first organizations to call the death of ISON, has had to re-assess the situation. A small part of the nucleus may be intact, its experts say. How much of the once 2 km-wide hunk of dirty ice could have survived is impossible to say. Passing just 1.2 million km above the surface of the Sun would have severely disrupted ISON. Its ices would have vaporized rapidly in temperatures over 2,000C. And the immense gravity of the star would also have pulled and squeezed on the object as it tumbled end over end. Karl Battams said: “We would like people to give us a couple of days, just to look at more images as they come from the spacecraft, and that will allow us to assess the brightness of the object that we’re seeing now, and how that brightness changes. Whatever happens next, comets are going to be a big feature in the news over the next year.